This article is about the fictional agency. For other uses, see S.H.I.E.L.D. (disambiguation). S.H.I.E.L.D. is a fictional espionage, special law enforcement, and counter-terrorism agency appearing in American comic books published by Marvel Comics. Created by Stan Lee and Jack Kirby in Strange Tales #135 (Aug. 1965), it often deals with paranormal and superhuman threats. The acronym originally stood for Supreme Headquarters, International Espionage and Law-Enforcement Division. It was changed in 1991 to Strategic Hazard Intervention Espionage Logistics Directorate. Within the various films set in the Marvel Cinematic Universe, as well as multiple animated and live-action television series, the backronym stands for Strategic Homeland Intervention, Enforcement and Logistics Division. The organization has heavily appeared in media adaptations as well as films and shows that take place in the Marvel Cinematic Universe. 1.1.1 Nick Fury, Agent of S.H.I.E.L.D. 1.1.2 Nick Fury vs. S.H.I.E.L.D. 1.1.4 Kitty Pryde, Agent of S.H.I.E.L.D. 1.1.6 Howling Commandos of S.H.I.E.L.D. S.H.I.E.L.D. 's introduction in the Strange Tales feature "Nick Fury, Agent of S.H.I.E.L.D." occurred during a trend for action series about secret international intelligence agencies with catchy acronyms, such as television's The Man from U.N.C.L.E., which Stan Lee stated in a 2014 interview, was the basis for him to create the organization. Colonel Fury (initially the lead character of Marvel Comics' World War II series Sgt. Fury and his Howling Commandos) was reimagined as a slightly older character with an eyepatch (which he lacked in his wartime adventures) and appointed head of the organization. Some characters from the Sgt. Fury series reappeared as agents of S.H.I.E.L.D., most notably Timothy "Dum-Dum" Dugan, Fury's bowler hat–wearing aide-de-camp. Its most persistent enemy is Hydra, a criminal organization founded (after some retcon) by Baron Wolfgang von Strucker. Strange Tales #135 (Aug. 1965), the debut of S.H.I.E.L.D.. Cover art by Jack Kirby and Frank Giacoia. S.H.I.E.L.D. was presented as an extant, full-blown entity in its first appearance, with Tony Stark in charge of the Special Weaponry section and Fury seeing "some of the most famous joes from every nation" (then "half the leaders of the free world" a page later) at a meeting of the Supreme International Council. Much was revealed over the years to fill in its labyrinthine organizational history. Stan Lee wrote each story, abetted by artist Kirby's co-plotting or full plotting, through Strange Tales #152 (Jan. 1967), except for two issues, one scripted by Kirby himself (#148) and one by Dennis O'Neil (#149). Following an issue scripted by Roy Thomas (#153), and one co-written by Thomas and new series artist Jim Steranko, came the sole-writer debut of soon-to-become industry legend Steranko—who had begun on the feature as a penciller-inker of Kirby layouts in #151 (Dec. 1966), taken over the every-other-issue "Nick Fury" cover art with #153 two months later, and full writing with #155 (April 1967). [E]ven the dullest of readers could sense that something new was happening. … Which each passing issue Steranko's efforts became more and more innovative. Entire pages would be devoted to photocollages of drawings [that] ignored panel boundaries and instead worked together on planes of depth. The first pages … became incredible production numbers similar in design to the San Francisco rock concert poster of the period. Larry Hama said Steranko "combined the figurative dynamism of Jack Kirby with modern design concepts. The graphic influences of Peter Max, Op Art and Andy Warhol were embedded into the design of the pages — and the pages were designed as a whole, not just as a series of panels. All this, executed in a crisp, hard-edged style, seething with drama and anatomical tension". The series won 1967 and 1968 Alley Awards, and was inducted in the latter year to the awards' Hall of Fame. Steranko himself was inducted into the Comic Book Hall of Fame in 2006. The 12-page feature ran through Strange Tales #168 (sharing that "split book" with the occult feature "Doctor Strange" each issue), after which it was spun off onto its own series of the same title, running 15 issues (June 1968–Nov. 1969), followed by three all-reprint issues beginning a year later (Nov. 1970–March 1971). Steranko wrote and drew issues #1–3 and #5, and drew the covers of #1–7. New S.H.I.E.L.D. stories would not appear for nearly two decades after the first solo title. A six-issue miniseries, Nick Fury vs. S.H.I.E.L.D. (June–Nov. 1988) was followed by Nick Fury, Agent of S.H.I.E.L.D. (vol. 2). This second series lasted 47 issues (Sept. 1989–May 1993); its pivotal story arc was "the Deltite Affair", in which many S.H.I.E.L.D. agents were replaced with Life Model Decoy androids in a takeover attempt. A year after that series ended, the one-shot Fury (May 1994) retconned the events of those previous two series, recasting them as a series of staged events designed to distract Fury from the resurrection plans of Hydra head von Strucker. The following year, writer Howard Chaykin and penciler Corky Lehmkuhl produced the four-issue miniseries Fury of S.H.I.E.L.D. (April–July 1995). Various publications have additionally focused on Nick Fury's solo adventures, such as the graphic novels and one-shots Wolverine/Nick Fury: The Scorpio Connection (1989), Wolverine/Nick Fury: Scorpio Rising (Oct. 1994), Fury/Black Widow: Death Duty and Captain America and Nick Fury: Blood Truce (both Feb. 1995), and Captain America and Nick Fury: The Otherworld War (Oct. 2001). Nick Fury, Agent of S.H.I.E.L.D. is a comic book series published by Marvel Comics, that first premiered in Strange Tales and later became several ongoing series. Main article: Nick Fury vs. S.H.I.E.L.D. Nick Fury vs. S.H.I.E.L.D. is a comic book miniseries published by Marvel Comics, that first premiered in 1988. Main article: Fury of S.H.I.E.L.D. Fury of S.H.I.E.L.D. is a comic book miniseries published by Marvel Comics, that first premiered in 1995. Main article: Kitty Pryde, Agent of S.H.I.E.L.D. Kitty Pryde, Agent of S.H.I.E.L.D. is a comic book series published by Marvel Comics, that first premiered in 1997. S.H.I.E.L.D. is a comic book title published by Marvel Comics. The first series premiering with a first issue cover dated June 2010. It details the secret history of the occult organization S.H.I.E.L.D. The series is written by Jonathan Hickman and drawn by Dustin Weaver. The second series premiering with a first issue cover dated December 2014. Loosely based on the TV series Marvel's Agents of S.H.I.E.L.D., it was written by Mark Waid. It was superseded by Agents of S.H.I.E.L.D. Main article: Howling Commandos of S.H.I.E.L.D. Howling Commandos of S.H.I.E.L.D. is a comic book series published by Marvel Comics, premiering with a first issue cover dated in 2015. To celebrate the 50th anniversary of the organization's creation, Marvel in 2015 released five one-shots each focusing on different aspects of S.H.I.E.L.D. : Agent Carter: S.H.I.E.L.D. 50th Anniversary, The Cavalry: S.H.I.E.L.D. 50th Anniversary, Fury: S.H.I.E.L.D. 50th Anniversary, Mockingbird: S.H.I.E.L.D. 50th Anniversary and Quake: S.H.I.E.L.D. 50th Anniversary. Agents of S.H.I.E.L.D. is a comic book series published by Marvel Comics, premiering with a first issue cover dated in 2016. A rare quiet moment for Nick Fury: Strange Tales #168 (May 1968). Art by Jim Steranko and Joe Sinnott. Usually led by Nick Fury as executive director (although he reports to a twelve-member council, whose identities even he does not know), this organization often operates as much as a covert agency as a quasi-military one, initially depicted as affiliated with the United States government. Later, S.H.I.E.L.D. was depicted as under the jurisdiction of the United Nations, with vast technological resources at its disposal, with U.N. General Assembly Resolutions and legislation passed in signatory nations aiding many of their operations. However, S.H.I.E.L.D. has been inconsistently portrayed as under U.S., rather than U.N., control - for instance, in Astonishing X-Men #3, Nick Fury explains S.H.I.E.L.D. 's inaction during an incident of genocide by stating that it did not occur on American soil. S.H.I.E.L.D. started off as a top secret international organization (Fury was unaware of them when he was in the CIA) with a Supreme International Council made up of top officials and minds from across the world, including Tony Stark. 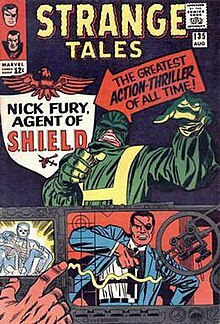 Its first director was Rick Stoner, former head of the CIA, but he was quickly assassinated by Hydra, and the President of the United States recommended Nick Fury take the role. Later on, the ultimate authority of S.H.I.E.L.D. is revealed to be a cabal of 12 mysterious men and women who give Fury his orders and operational structure, leaving Fury to manage the actual implementation of these orders and stratagems. One of S.H.I.E.L.D. 's unique technological innovations, the LMD (Life Model Decoy) — an extremely lifelike android used to replace people in imminent danger of being killed — was the basis for two major upheavals. First, the supervillain Scorpio stole the technology and used it to create the second team of villains called the Zodiac. Later, some LMDs known as the Deltites achieved sentience and infiltrated S.H.I.E.L.D. and Hydra both, replacing key members until Fury defeated them. This led to the disbanding of the original organization and its replacement by a new task force with the same acronym under the control of the U.N. ("Strategic Hazard Intervention, Espionage and Logistics Directorate") The new S.H.I.E.L.D. was meant to be more streamlined so Fury could personally oversee it, but would soon become a large organization again. Agents Valentina Allegra de Fontaine and Dum Dum Dugan, Strange Tales #168 (May 1968). Art by Steranko and Sinnott. The passage of the United States' Superhuman Registration Act and the subsequent superhero "Civil War" created an additional political and ethical irritant between S.H.I.E.L.D. and the superhuman community, with S.H.I.E.L.D. tasked to lead enforcement and to take on registered superheroes as operatives. Toward the end of the conflict, Hill concluded she had been made director with the intent that she fail at the job, and she proposes to Tony Stark that he assume the post himself, with her as deputy. Stark accepts the appointment as director upon the conclusion of the superhuman Civil War, and undertakes a series of initiatives, including the construction of a new gold-and-red Helicarrier in the motif of his Iron Man armor designs, the introduction of a daycare center in the Helicarrier, and an employee suggestion-box. While accused of treating S.H.I.E.L.D. as a Stark Industries subsidiary, he succeeded in streamlining the organization and raising morale. S.H.I.E.L.D. fought a wave of global superhuman terrorism and was manipulated into two international incidents that almost saw Director Stark arrested, until they revealed the Mandarin to be behind it and stopped him from committing genocide with an Extremis pathogen. At the start of the Secret Invasion by the extraterrestrial shape-shifting race the Skrulls, the Helicarrier is disabled by a Skrull virus and left floating and disabled in the Bermuda Triangle. The Skrulls by this point have already replaced a large number of S.H.I.E.L.D. agents, including the high-ranking Timothy "Dum-Dum" Dugan. After the invasion is repelled, the President of the United States decides to dissolve S.H.I.E.L.D., and has it, the Fifty State Initiative, and the Avengers replaced by the Thunderbolts Initiative, which is placed under the supervision of Norman Osborn. Osborn uses the opportunity to transform S.H.I.E.L.D. into a new organization called "H.A.M.M.E.R. ", formed by loyal agents of the Thunderbolts Initiative as well as former agents of S.H.I.E.L.D. and Hydra. The Thunderbolts are officially disbanded in the process as well and turned into a black-ops force that answers only to Osborn. Meanwhile, H.A.M.M.E.R. also operates alongside the newest, and only government-sponsored Avengers team, the Dark Avengers. After the Invasion, Fury discovers that S.H.I.E.L.D. itself had been under the control of the terrorist organization Hydra ostensibly from its very beginning. After the conclusion of the Secret Warriors ongoing series, S.H.I.E.L.D. was reformed with Fury leaving it under the control of its new director, Daisy Johnson. The new S.H.I.E.L.D. subsequently saved US Army Ranger Marcus Johnson from mercenaries hired by the Leviathan. When he discovered he was the son of Nick Fury, Marcus (whose birth name was Nick Fury, Jr.) and his army friend Phil Coulson joined S.H.I.E.L.D. Maria Hill and the rest of S.H.I.E.L.D. later formed their incarnation of the Secret Avengers. During the Avengers: Standoff! storyline, S.H.I.E.L.D. establishes a gated community called Pleasant Hills to serve as a super villain prison. Using technology derived from the Cosmic Cube called Kobik, S.H.I.E.L.D. converts the inmates into the mild-mannered residents of Pleasant Hills. Over the decades, various writers have depicted S.H.I.E.L.D. 's organizational structure in several different ways. The Official Handbook of the Marvel Universe (first edition) describes an eight-level ranking structure (technician, administrator, field agent, regional officer, special officer, regional director, special director, executive director), although providing almost no detail on other aspects of the Directorate's internal makeup. Years later, the miniseries Agents of Atlas mentioned a position of "sub director", and seemed to indicate that the administrative department of S.H.I.E.L.D. it itself referred to simply as "Directorate". Most of S.H.I.E.L.D. 's agents are normal humans. At one point the organization attempted to set up a team of superhuman agents, composed of Marvel Man (the future Quasar), Texas Twister, Blue Streak and the Vamp but the latter two were secretly agents of the criminal organization The Corporation, and the team broke apart before it had its first official mission. A second team organized years later also lasted only a short while. Its headquarters is the Helicarrier, a massive flying aircraft carrier kept airborne at all times and, among other things, containing a squadron of jet fighters and housing an intercontinental ballistic missile (ICBM). In addition, S.H.I.E.L.D. maintains strong ties to the superhero community, especially Captain America, the Avengers, and the Fantastic Four, and often calls upon that community for aid on particular missions. In the 2000s, depictions of S.H.I.E.L.D. imply a hierarchy of security clearance levels used either in place of, or alongside, the previously described rank structure. The security-clearance hierarchy operates on a scale ranging from "Level One", the lowest, to "Level Ten", described by Maria Hill, executive director at the time, as the highest security clearance anyone of any government can have. Hill's own clearance, cited in the New Avengers ongoing series, was Level Eight. 2001 trade-paperback collection, with repurposed cover art from Nick Fury, Agent of S.H.I.E.L.D. #4 (March 1968) by Jim Steranko. Throughout its existence, S.H.I.E.L.D. has been most prominently led by Nick Fury, with Maria Hill succeeding him in mid-2000s stories. She voluntarily stepped down in a 2007 story, becoming deputy director to Tony Stark. Other historically prominent members, who have appeared from the earliest stories to the modern day, include Thaddeus "Dum Dum" Dugan and Gabriel "Gabe" Jones, both veterans of Fury's World War II Howling Commandos, though their youthful longevity has not, unlike Fury's, been explained in Marvel continuity; Contessa Valentina Allegra de la Fontaine; Clay Quartermain (Agent 9); Jasper Sitwell (Agent 12); and Sharon Carter (Agent 13), all introduced in the 1960s; and Jimmy Woo, introduced in the 1950s comic Yellow Claw and reintroduced in the ' 60s. Prior to the events of the Civil War, Captain America estimated there to be 3,000 agents on active duty. Although the various Helicarriers built over the years have long been considered S.H.I.E.L.D. 's primary mobile home base, the Directorate also maintains a number of land bases throughout the world, most notably "S.H.I.E.L.D. Central" in New York City. While some of these bases are publicly accessible on a limited basis, most are not publicly disclosed for reasons of planetary security. There are several fully equipped S.H.I.E.L.D. fall-out shelters scattered around the world, with twenty-eight of these being known only to Nick Fury. During the events of Civil War, Nick Fury was hiding in an American-based shelter. He also divulged the location of one to Captain America, so the Resistance to the Superhuman Registration Act could use it as a safe house. A.R.M.O.R. (Altered-Reality Monitoring and Operational Response) is a sister agency to S.H.I.E.L.D. that monitors alternate reality incursions into Earth-616. It was introduced in the Marvel Zombies 3 limited series, written by Fred Van Lente. Van Lente stated that A.R.M.O.R. "has existed with them this whole time, but it's been so incredibly secret that no one at Marvel knew about it". In the comics it is stated that A.R.M.O.R. is so secret that it 'makes S.W.O.R.D. look like S.H.I.E.L.D., and S.H.I.E.L.D. look like the Post Office'. During Dark Reign, A.R.M.O.R. operates under the oversight of H.A.M.M.E.R. but Osborn wanted to fully absorb A.R.M.O.R. into H.A.M.M.E.R. They were able to keep out of Osborn's clutches when their newest agent, Lyra downloaded incriminating evidence against him. H.A.M.M.E.R. replaces S.H.I.E.L.D. after it is dissolved when Norman Osborn is appointed the new head following the conclusion of the Skrull attack. It was not established what H.A.M.M.E.R. stands for; in Dark Avengers #1, Osborn told Victoria Hand, the new Deputy Director, that it does stand for something, and when she asked what it stands for, he told her, "Get to work on it for me. That is one of the many things on your 'To Do' list". Former S.H.I.E.L.D. agents and members of Hydra are hired as agents. H.A.M.M.E.R. promotes Osborn's personal team of Avengers, a group composed mostly of former Thunderbolts members and former members of the Mighty Avengers. Osborn also eliminates all of Tony Stark's influence on S.H.I.E.L.D., including the Cape-Killer Armor and the Red and Gold Helicarrier. He also replaces all agents loyal to Nick Fury, Captain America, or Iron Man with agents loyal to himself. Also, in the Captain America: Reborn Prelude, when Sin, who is captured by H.A.M.M.E.R, asks what it stands for, the agent present says that it's classified and she does not have security clearance. In the pages of Avengers World, S.P.E.A.R. is a Chinese intelligence-gathering organization created for home land security and has a flying headquarters called the Circle. It was created by the Chinese government to be on the same level as S.H.I.E.L.D. following Thanos' invasion of Earth. Falcon first encountered S.P.E.A.R. and their director Xian Zheng at the time when Gorgon planned to launch an attack on China using the giant dragon whose head is where Madripoor grows out of. When the Hand attacked the Circle, they deployed their own superhuman response team called the Ascendants which consists of Devastator III, Monkey King, Sabre III, Vector II, and Weather Witch. S.T.R.I.K.E. (Special Tactical Response for International Key Emergencies) was a British agency, unrelated to but run along similar lines to S.H.I.E.L.D. Disbanded after being infiltrated and taken over by a criminal organization, one of its members was the future X-Man Psylocke. It was introduced in Marvel UK's Captain Britain #17 (Feb. 2, 1977). EuroM.I.N.D. (European Monitoring Investigation and Enforcement Division) is a European subdivision of S.H.I.E.L.D. that later fell under the control of the S.H.A.P.E. (Supreme Headquarters Allied Powers Europe) council. EuroM.I.N.D. 's director is François Borillon. Its agents include the science reconnaissance group Eurolab and the combat specialist Task Force group, who both then merged into one group known as Euroforce. S.T.A.K.E. (Special Threat Assessment for Known Extranormalities) is a S.H.I.E.L.D. subsidiary that specializes in dealing with supernatural occurrences. S.W.O.R.D. (Sentient World Observation and Response Department), works with S.H.I.E.L.D. but specializes in extraterrestrial threats. It is first introduced in Astonishing X-Men (vol. 3) #6 (Dec. 2004), written by Joss Whedon. Dialogue in the stories depicting both organizations has been ambiguous on whether S.W.O.R.D. is a branch of S.H.I.E.L.D. or a sister agency. Agent Abigail Brand, the S.W.O.R.D. agent the X-Men encountered, has green hair, a trait typical of agents of S.H.I.E.L.D. 's archenemy, Hydra. This unusual characteristic did not go unremarked; Wolverine referred to her as "Hydra-Hair" in Astonishing X-Men (vol. 3) #6. A similar group as S.W.O.R.D., likewise affiliated with the U.N., is Starcore, which has worked with S.H.I.E.L.D. on several projects of joint interest, including establishing and maintaining a crewed facility on Earth's Moon. W.A.N.D. stands for Wizardry, Alchemy and Necromancy Department, and is a division of S.H.I.E.L.D that specializes in matters relating to magic. It is directed by Pandora Peters. First appearing in Thunderbolts Annual Vol.2 (2014), in which the Thunderbolts are recruited to assassinate Doctor Strange, who is eventually revealed as a faerie impostor called King Oberoth M'gozz. S.H.I.E.L.D. (Strategic Hazard Intervention Espionage Logistics Directorate) is the Amalgam Comics equivalent of S.H.I.E.L.D. from Marvel Comics. They first appeared in Bruce Wayne Agent of S.H.I.E.L.D. #1, though in Amalgam continuity, they first appeared in the metafictional Agents of S.H.I.E.L.D. strip. S.H.I.E.L.D. was first created by Nick Fury and Sgt. Rock after World War II in order to tackle the danger posed by Hydra. Both founders later trained and recruited Bruce Wayne into their ranks, who would become the new director of S.H.I.E.L.D. S.H.I.E.L.D. was mentioned briefly in the Mutant X alternate universe series as a murderous anti-mutant group. S.H.I.E.L.D. stood for Saviours of Humanity by Intervention in the Evolution of Life-form Deviants. Their story is elaborated on later as one of their own gains powers. S.H.I.E.L.D. in the Ultimate Marvel parallel universe was first led by General "Thunderbolt" Ross. During the Gulf War, the Weapon X Project, headed by Colonel John Wraith, was sanctioned by S.H.I.E.L.D. and resulted in the creation of Wolverine. In the Ultimate Marvel universe, S.H.I.E.L.D. is controlled entirely by the United States, but maintains ties with the European Defense Initiative and the British-operated S.T.R.I.K.E. Main article: List of S.H.I.E.L.D. members § Ultimate S.H.I.E.L.D. Introduced in Marvel's line of novels in the mid-1990s, S.A.F.E. (Strategic Action For Emergencies) is the United States' answer to S.H.I.E.L.D. It first appeared in Spider-Man & the Incredible Hulk: Rampage (Doom's Day Book 1), and may not be part of comics canon, although the novels it appears in have been referred to several times in Marvel's Handbooks. Whereas S.H.I.E.L.D. is a U.N.-chartered organization dealing with international incidents, S.A.F.E. is tasked with similar duties inside America's borders. It is run by Colonel Sean Morgan. A prominently featured agent is Joshua Ballard, who, among other things, survived an encounter with Doctor Doom and later Baron Zemo. In the novel Secret of the Sinister Six, S.A.F.E. agent Clyde Fury (no relation to Nick Fury) distinguishes between espionage agencies (such as S.H.I.E.L.D.) and strategic action specialists such as S.A.F.E. H.A.T.E. stands for the Highest Anti Terrorism Effort. It is a parody of S.H.I.E.L.D. created for Marvel Comics' 12-issue series Nextwave by comics author Warren Ellis. The leader of H.A.T.E., General Dirk Anger is a parody of Nick Fury. This series depicts H.A.T.E. as being a secretive organization with suspect motives led by the madman, Anger, who has self-control and sexual issues. S.H.I.E.L.D. 's first television appearance was in the Spider-Man and His Amazing Friends episode "Mission: Save the Guardstar". S.H.I.E.L.D. is featured in Season Two of the 1990s Iron Man animated series. S.H.I.E.L.D. made several appearances in the 1990s Spider-Man animated series, beginning in the first-season episode "Day of the Chameleon". All subsequent S.H.I.E.L.D. appearances on the show included Nick Fury. Agent 1 was the only other identified agent. S.H.I.E.L.D. made several appearances in X-Men: Evolution. S.H.I.E.L.D. is featured in The Super Hero Squad Show. Outside of Nick Fury being featured, Ms. Marvel is depicted as an agent of S.H.I.E.L.D. S.H.I.E.L.D. appears in Iron Man: Armored Adventures. S.H.I.E.L.D. appears in the Marvel Anime: Wolverine episode "Omega Red". In a flashback, a S.H.I.E.L.D. commander sends Wolverine on a black ops mission to infiltrate and steal the carbonadium from the Russians. S.H.I.E.L.D. appears in The Avengers: Earth's Mightiest Heroes. S.H.I.E.L.D. appears in Ultimate Spider-Man. Nick Fury and Phil Coulson are the identified members of S.H.I.E.L.D. that appears in the show. The series itself revolves around a S.H.I.E.L.D. training program held by Nick Fury and Phil Coulson for young superheroes consisting of Spider-Man, White Tiger, Power Man, Iron Fist and Nova. At the end of the episode "Stan By Me", it is revealed that Stan the Janitor was one of the original members of S.H.I.E.L.D. and came up with the organization's acronym. In the episode, "The Parent Trap", it is revealed that Power Man's parents worked for S.H.I.E.L.D. and used their version of the Super Soldier Serum to give their son superpowers. In the episode, "Ultimate Venom", Spider-Man discovers that he has inspired a new generation of young heroes by becoming an Avenger. He convinces Fury to recruit them to form a new team, the New Warriors. S.H.I.E.L.D. is featured in Avengers Assemble. S.H.I.E.L.D. is featured in Hulk and the Agents of S.M.A.S.H. A S.H.I.E.L.D. television series was greenlit by ABC in 2012, first aired as Marvel's Agents of S.H.I.E.L.D., in September 2013. S.H.I.E.L.D. appears in the 1998 TV-film Nick Fury: Agent of S.H.I.E.L.D.. After the retirement/exile of Nick Fury, S.H.I.E.L.D. has been under the control of rival General Director Jack Pincer. It is first referenced in Iron Man when Agent Phil Coulson attempts to talk with Tony Stark about his escape from captivity. As a running gag, the agency is always referred to by its full name, followed by remarks to the effect that it needs something shorter; near the film's end, Coulson stops Pepper Potts midway through saying it and says, "Just call us SHIELD." In a post-credits scene, Tony Stark meets Nick Fury, played by Samuel L. Jackson, who says he wants to talk to him about the "Avengers Initiative". S.H.I.E.L.D. is briefly referenced in The Incredible Hulk when it is shown that S.H.I.E.L.D. was aware of the experiment on which Dr. Bruce Banner was working about making humans immune to gamma radiation. Later, General Ross states that Bruce Banner's and his partner's aliases "have been added to the S.H.I.E.L.D. Operations Database". In the post-credits scene, General Ross is approached by Tony Stark, who reveals that they were gathering some kind of a special "team". S.H.I.E.L.D. appears in Iron Man 2. Black Widow is shown to be a S.H.I.E.L.D. agent when Nick Fury sends her to keep an eye on Tony Stark. Phil Coulson was also featured, overseeing Tony Stark's S.H.I.E.L.D. style house arrest until being called away. It is stated that Howard Stark is one of the founders of S.H.I.E.L.D. In the post-credits scene, Phil Coulson arrives in Albuquerque, New Mexico where he calls Nick Fury and tells him that he found the item Fury wanted him to look for, as the final shot shows Thor's hammer, Mjolnir. S.H.I.E.L.D. appears in Thor. In a follow-up to the post-credits scene of Iron Man 2, Phil Coulson leads a S.H.I.E.L.D. team to safeguard the area that Mjolnir landed. Jasper Sitwell (portrayed by Maximiliano Hernández) is also featured in the film. In the post-credits scene, Erik Selvig is brought onto S.H.I.E.L.D. by Nick Fury to study the Tesseract. S.H.I.E.L.D. appears at the end of Captain America: The First Avenger. When Steve Rogers awakens in modern times and makes his way out of a building, he is greeted by Nick Fury and some S.H.I.E.L.D. agents. S.H.I.E.L.D. is featured in the 2012 film The Avengers. Nick Fury, Phil Coulson, Natasha Romanoff, Jasper Sitwell, and Clint Barton appear as well as S.H.I.E.L.D. Deputy Director Maria Hill (portrayed by Cobie Smulders). A substantial part of the film takes place within the S.H.I.E.L.D. Helicarrier. S.H.I.E.L.D. is mentioned only once in Iron Man 3 by Tony Stark. Stark hacks into S.H.I.E.L.D. 's Mandarin investigation database (and reveals that S.H.I.E.L.D. was, in fact, working on the Mandarin threat). S.H.I.E.L.D features prominently in Captain America: The Winter Soldier with Captain America as a S.H.I.E.L.D. agent, along with Black Widow, Nick Fury, Maria Hill, Jasper Sitwell, Sharon Carter, Brock Rumlow, Jack Rollins, and Alexander Pierce. The history of S.H.I.E.L.D. is further explored in the film. It is revealed that Arnim Zola was brought on board in S.H.I.E.L.D. 's inception for his scientific expertise, but he secretly regrew Hydra within the organization with the purpose of identifying and eliminating potential threats to Hydra's goals. Pierce, Rumlow, Rollins, and Sitwell are revealed to be sleeper agents of Hydra within the agency. When Rogers exposes Hydra within S.H.I.E.L.D., Fury, Romanoff, Carter, Hill, and others leave the agency as it falls apart. In Avengers: Age of Ultron, S.H.I.E.L.D. is said to have collapsed. Fury appears to encourage the Avengers while Maria Hill now works for Stark. Fury later appears at the final battle in Sokovia with a Helicarrier that Phil Coulson pulled out of mothballs, some S.H.I.E.L.D. agents and James Rhodes to help. When asked, Steve Rogers comments that "this is what S.H.I.E.L.D. is supposed to be" as the Helicarrier is used to rescue thousands of people from their now-floating landmass before it is destroyed by Thor and Iron Man to save the world. In Ant-Man, Hank Pym and Janet Van Dyne were S.H.I.E.L.D. agents who worked with Peggy Carter and Howard Stark during the Cold War. In Captain Marvel, set in 1995, Nick Fury and Phil Coulson were low ranking S.H.I.E.L.D. agents who formed an alliance with Carol Danvers. The Marvel One-Shots film The Consultant featured Phil Coulson and Jasper Sitwell trying to keep the World Security Council from putting Abomination into their services. The Marvel One-Shots film A Funny Thing Happened on the Way to Thor's Hammer feature Phil Coulson traveling to New Mexico between Iron Man 2 and Thor. The Marvel One-Shots film Item 47 featured Agent Blake (portrayed by Titus Welliver) who helps Jasper Sitwell secure "Item 47" (a discarded Chitauri gun) which ended up in the possession of a down-on-their-luck couple named Bennie and Claire (portrayed by Jesse Bradford and Lizzy Caplan). In the aftermath, the couple joins up with S.H.I.E.L.D. where Bennie assigned to the R&D "think-tank" to reverse engineer the Chitauri technology and Claire becomes Blake's assistant. The Marvel One-Shots film Agent Carter features Peggy Carter being made an offer to join S.H.I.E.L.D. by Howard Stark. Timothy "Dum Dum" Dugan (portrayed by Neal McDonough) also appears. S.H.I.E.L.D. appears in Iron Man: Rise of Technovore. S.H.I.E.L.D. appears in Avengers Confidential: Black Widow & Punisher. S.H.I.E.L.D. appears in Marvel: Ultimate Alliance; the first mission involves an attack on the S.H.I.E.L.D. Helicarrier by the Masters of Evil, with S.H.I.E.L.D. subsequently overseeing the creation of a special strike force of heroes intended to oppose the Masters' scheme to steal Odin's power for Doctor Doom. S.H.I.E.L.D. has a prominent role in Marvel: Ultimate Alliance 2 with the passing of the Superhuman Registration Act. The Ultimate incarnation of S.H.I.E.L.D. appeared in Spider-Man: Shattered Dimensions. Carnage launches an attack on the Triskelion, and uses a fragment of the Tablet of Order and Chaos to reanimate the dead S.H.I.E.L.D. agents into zombies. S.H.I.E.L.D. appears in Marvel: Avengers Alliance. Outside of Nick Fury, Maria Hill, and Phil Coulson being members of S.H.I.E.L.D., the player controls a S.H.I.E.L.D. agent when fighting the villains. S.H.I.E.L.D. appears in Marvel Heroes. S.H.I.E.L.D. appears in Lego Marvel Super Heroes. Agent Coulson and Maria Hill appear as playable characters. S.H.I.E.L.D. appears in Disney Infinity: Marvel Super Heroes. Director Nick Fury is a playable character and S.H.I.E.L.D. directs the player on many missions throughout "The Avengers" and "Spider-Man" playsets. S.H.I.E.L.D. appears in the 2005 video game "The Punisher". S.H.I.E.L.D. appears in Spider-Man: Web of Shadows. They arrive in New York to fight off the symbiote invasion. S.H.I.E.L.D. appears in the Marvel Universe LIVE! stage show. S.H.I.E.L.D. stories have been translated into several other languages, including French, Finnish and Italian. Occasionally, these translations will show S.H.I.E.L.D. with an altered name. In the case of selected French editions, the name of the agency was depicted as S.E.R.V.O., which sounds like "brain" (cerveau) in French. In later editions, S.H.I.E.L.D is maintained, with the acronym translated as Stratégie, Habilité, Intervention, Exécution et Logistique Défensive (Strategy, Empowered, Intervention, Enforcement and Logistics Defensive). In Finnish the name that applies to S.H.I.E.L.D. in mainstream Marvel continuity is Y.P.K.V.V. (Ylimmäisen Päämajan Kansainvälisen Vakoilun Vastustamisjaos), a direct translation of the original English. In translations of the Ultimate Marvel comics, the name is K.I.L.P.I., with "kilpi" being the translation for the word (as opposed to the acronym) "shield". In Greek, the organization name is Α.Σ.Π.Ι.Δ.Α. (pronounced ASPIDA, meaning "shield" in Greek). The initials stand for Supreme Military and Political Foundation of International Counter-espionage (Ανώτατο Στρατιωτικό Πολιτικό Ίδρυμα Διεθνούς Αντικατασκοπείας). In Portuguese, the name S.H.I.E.L.D. remains, but it is translated as "Superintendência Humana de Intervenção, Espionagem, Logística e Dissuasão", i. e., Human Superintendence for Intervention, Espionage, Logistics and Dissuasion. In Dutch the name S.C.H.I.L.D. 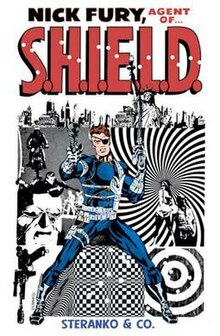 (schild = shield) has been used by the publisher Williams, but was dropped by Junior Press in favor of S.H.I.E.L.D. In Mexico, it was translated by La Prensa and later Novedades, as C.I.D.E.L., Centro Internacional De Espionaje Legal (International Center of Legal Espionage), but later Novedades changed the acronym to C.S.E.I., Cuartel Supremo de Espionaje e Inteligencia (Supreme Headquarters of Espionage and Intelligence). In Spain, initial publisher Vértice translated S.H.I.E.L.D. as "Escudo" (always without a determinant), but never showed the meaning. Later publisher Planeta DeAgostini used the name S.H.I.E.L.D., but translating the acronym as "Organización Internacional para la Ejecución y el Cumplimiento de la Ley" (international organisation for implementation and fulfillment of law). It has been suggested, as a joke, that the acronym does not correspond to the meaning because the acronym itself is undercover. Now, Panini translates the acronym as "Servicio Homologado de Inteligencia, Espionaje, Logística y Defensa" (Accredited Service of Intelligence, Espionage, Logistics, and Defense) to keep the original acronym; being this the name used in the current movies or series. In Danish, S.H.I.E.L.D. was originally known as S.K.J.O.L.D., "Skjold" being the Danish word for a shield, though the meaning of the abbreviation would differ. In Russian, S.H.I.E.L.D. is named Щ.И.Т. (pronounced SCHIT; "shield" in Russian) or З.А.Щ.И.Т.А. (ZASCHITA, meaning "protection"). This name often describes as Sixth Intervention Logistics Agency (Шестая Интервенционная Тактико-оперативная логистическая служба). In Poland, S.H.I.E.L.D. is known as T.A.R.C.Z.A. ("shield" in Polish). This name describes as Secret Agency of Anti-terrorist Cybernetics Applications Development (Tajna Agencja Rozwoju Cybernetycznych Zastosowań Antyterrorystycznych). ^ Franich, Darren (24 September 2013). "SHIELD: 10 Important Facts about Marvel's superspy organization". Entertainment Weekly. Retrieved 25 September 2013. ^ a b Goldman, Eric (January 31, 2014). "Stan Lee Previews His Marvel's Agents of SHIELD Cameo". IGN. Retrieved January 31, 2014. ^ Cronin, Brian (April 15, 2010). "A Year of Cool Comics – Day 105". Comic Book Resources CSBG Archive. Retrieved September 29, 2010. ^ a b Strange Tales #135: "The Man For The Job!" ^ Hama, Larry (2001). "Introduction". Nick Fury, Agent of S.H.I.E.L.D. : Who Is Scorpio?. Marvel Enterprises. ISBN 0-7851-0766-5. ^ Schedeen, Jesse (February 23, 2010). "The Secret Masters of the Marvel Universe". IGN. Retrieved April 8, 2010. ^ Mahadeo, Kevin (April 6, 2010). "Tuesday Q&A: Jonathan Hickman". Marvel.com. Retrieved April 8, 2010. ^ Arrant, Chris (April 7, 2010). "Writer Hickman Reveals the History of Marvel's S.H.I.E.L.D." Newsarama. Retrieved April 8, 2010. ^ Sanderson, Peter (2007). The Marvel Comics Guide to New York City. New York City: Pocket Books. pp. 62–63. ISBN 1-416-53141-6. ^ Strange Tales #135: "The Man For The Job!" (page 2: "Spy guys like me are a dime a dozen!" "The White House thinks differently, Fury!" ^ As spelled officially by Marvel Comics on its S.H.I.E.L.D. page, although misspelled with a male name and spelled with different Italian article as "Valentina Allegro de Fontaine" in her name's first two mentions, in Strange Tales #159, "Spy School", 10, panel 6, and Strange Tales #162, "So Evil, the Night p.3, panel 6. ^ WW PHILLY: FRED VAN LENTE ON MARVEL ZOMBIES 3 by Vaneta Rogers Archived 2010-01-07 at the Wayback Machine. Newsarama.com. ^ "Captain America: Reborn Prelude Online Preview". Marvel.com. 2009-06-30. Retrieved 2011-01-12. ^ Ching, Albert. "SDCC 2011: MARVEL Television LIVE!". Newsarama. ^ Andreeva, Nellie (August 28, 2012). "ABC Greenlights 'S.H.I.E.L.D' Marvel Pilot, Joss Whedon To Co-Write & Possibly Direct". Deadline Hollywood. Retrieved August 28, 2012. ^ "Marvel's Agents of S.H.I.E.L.D." ABC Studios. April 6, 2013. Archived from the original on April 6, 2013. Retrieved April 6, 2013. ^ "Marvel's The Avengers Begins Production". Retrieved May 18, 2011. ^ "MARVEL-OUS STAR WATTAGE: Actors Assemble For Comic-Con Panel Including 'The Avengers', 'Captain America', & 'Thor'". Deadline Hollywood. 2010-07-24. Archived from the original on 2011-07-05. Retrieved 2011-08-03. ^ "New 'Avengers' Photo Introduces Cobie Smulders As Maria Hill". Retrieved October 25, 2011. ^ "Where Were The Avengers/SHIELD in Iron Man 3?". Retrieved October 8, 2014. ^ Mike Fleming Jr. "Five Actresses Testing For 'Captain America 2' Role; Black Widow Might Drop By As Well – Deadline.com - Deadline". Deadline Hollywood. ^ Marc Graser. "Frank Grillo to play Crossbones in 'Captain America' sequel". Variety. ^ Dominic Patten. "Movie Castings: Seth Rogen Scores 'The Interview', 'Endless Love' Remake Gets Leads & 'Winter Soldier' Sees Agent Return - Deadline". Deadline Hollywood. ^ "SDCC '13: Marvel Reveals AVENGERS: AGE OF ULTRON, Guardians Cast, More". Newsarama.com. ^ Nicholson, Matt (June 22, 2015). "Ant-Man Set And Edit Bay Visit: Making Marvel's Underdog Movie Page 3 of 3". IGN. Archived from the original on June 22, 2015. Retrieved June 22, 2015. ^ Coggan, Devan (September 13, 2018). "Clark Gregg teases Coulson and Fury's 'meet-cute' in Captain Marvel". Entertainment Weekly. Archived from the original on September 13, 2018. Retrieved September 13, 2018. ^ Busis, Hillary (2014-01-21). "'Marvel's Avengers Confidential: Black Widow & Punisher': See the trailer here! EXCLUSIVE". Entertainment Weekly. Retrieved 2014-01-21. ^ "Character Reveals for Marvel Universe LIVE! - News - Marvel.com". Don Markstein's Toonopedia: Nick Fury, Agent of S.H.I.E.L.D.